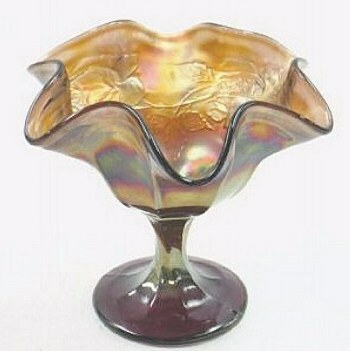 This Fenton segment exemplifies the use of nature’s surroundings to attain lovely and meaningful patterns. When considering the artistic talent displayed in the application of these everyday objects of beauty into a mould of iron, dedication to task becomes foremost! Amethyst WREATH OF ROSES Cup with Vintage Interior. WREATH of ROSES Punch Cup: A green punch set having Vintage interior appeared in a 1910 Butler Brothers Ad. A lovely photo displaying each interior appears in Fenton Glass-The First Twenty-Five Years by Heacock and Measell. 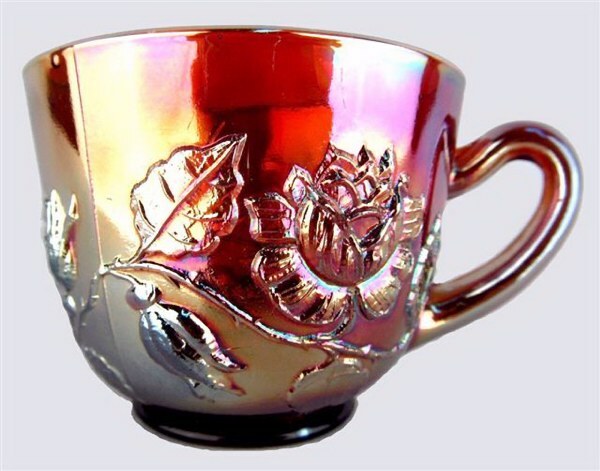 Interiors of the punch cups are also found having Vintage or Persian Medallion patterns. We are the first to admit the curiosity of finding such heavily patterned cup interiors! Use of a ladle for securing punch would be “tricky”, without very careful observance to avoid hitting some of the design. Perhaps a surplus of cups created the impetus for advertising them sitting on 6” Pinecone plates (or saucers, if you will)?? There is mention that blue cups are scarce. Other known colors are amethyst, green and marigold. Green WREATH of ROSES BonBon. WREATH of ROSES - Amethyst and Blue. 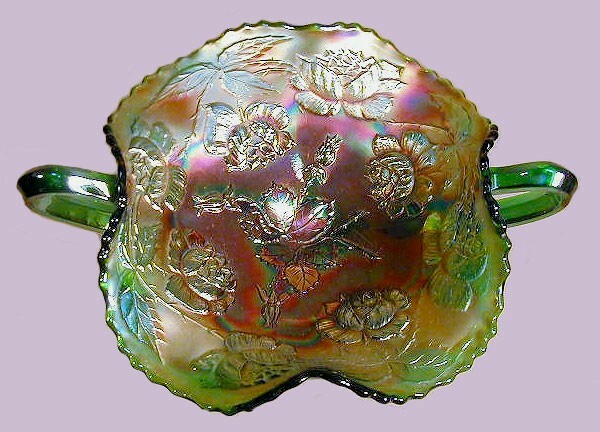 WREATH of ROSES Bonbon: This stemmed shape bonbon was available in 1910. Known colors are the same as those produced in the punch sets; amethyst, blue, green and marigold. Note the rose in center. This is not a plentiful pattern in any of the known shapes. A white bonbon surfaced in 1997 and sold at auction for $250. Amethyst WREATH OF ROSES Compote - 5 in. high. Marigold WREATH OF ROSES Compote. Green WREATH OF ROSES Compote. Courtesy Walt Robinson. WREATH of ROSES Stemmed Compote: Amethyst, blue, green and marigold are known colors. There is no rose in the center of the design. These are scarce in any color. These compotes are 4.75” high and can be flared as much as 6” wide. 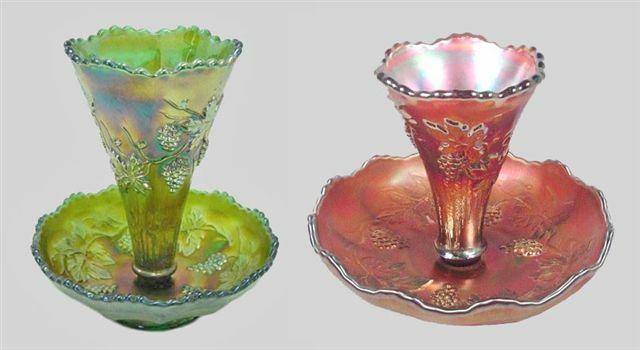 Both the bonbon and compote date from the 1910 era. Blue 6 in. PINECONE Saucer - Plate. 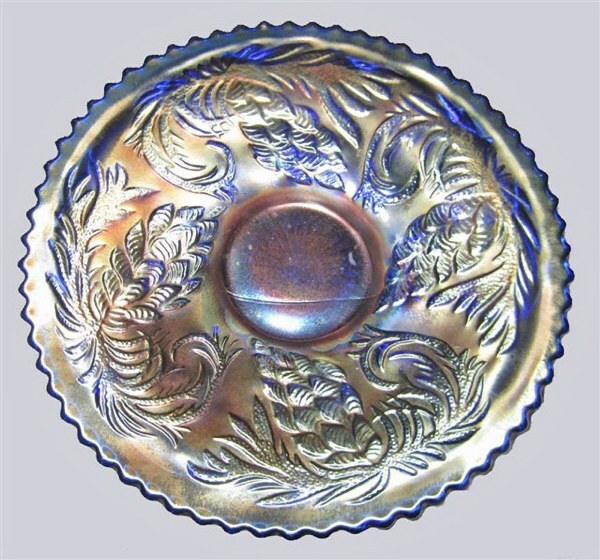 PINE CONE Plate/Saucer: 6 - 6 ½” and 7- 8” plates are known in this pattern. This smaller size may have either the sawtooth edge and narrow edge band or a scalloped edge with pattern extending to the edge. Colors in the smaller size are amethyst, blue, green, and marigold. Bowls or sauces, usually ruffled, are known in the same color range. WINE and ROSES - Goblet - 5.5 in. tall.Pitcher- 8 in. tall. 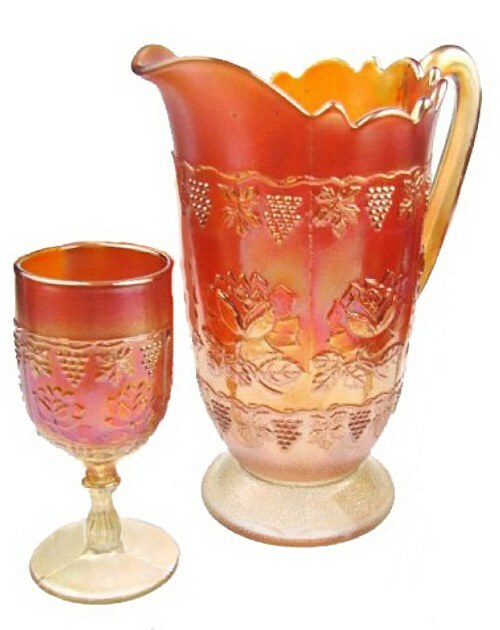 WINE & ROSES Cider Pitcher & Goblet: This pitcher appeared in the Feb. 1918 Butler Brothers Catalog. Interestingly, the pitchers are usually marigold, although quite scarce. Then, in 2001, a blue pitcher appeared in an auction! The stemmed goblets are known in aqua, blue, marigold, lime green and Vaseline! ………..according to colors listed on the Doty site. Stemmed Goblet in that pattern.- 4 3/4 inches tall. 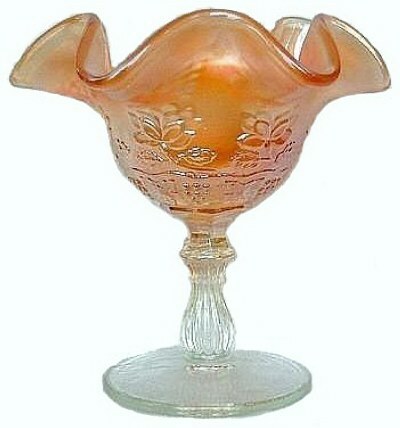 WINE & ROSES Compote: The scarce compotes were shaped from the cider goblet. 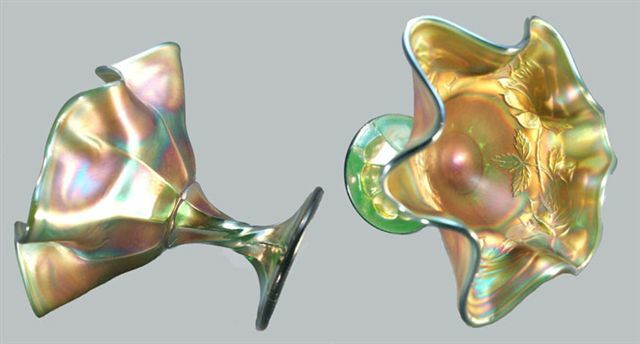 Only three marigold examples appeared at carnival glass auctions between 2003 and 2008. VINTAGE Epergne - Small size bowls with large 6 in. lily in green. The marigold lily is the smaller size. VINTAGE Epergne: Two sizes/types were produced. The version with the 6” lily is advertised in the 1911 Butler Ad. There are 5 clusters of grapes in the bowl of that epergne. 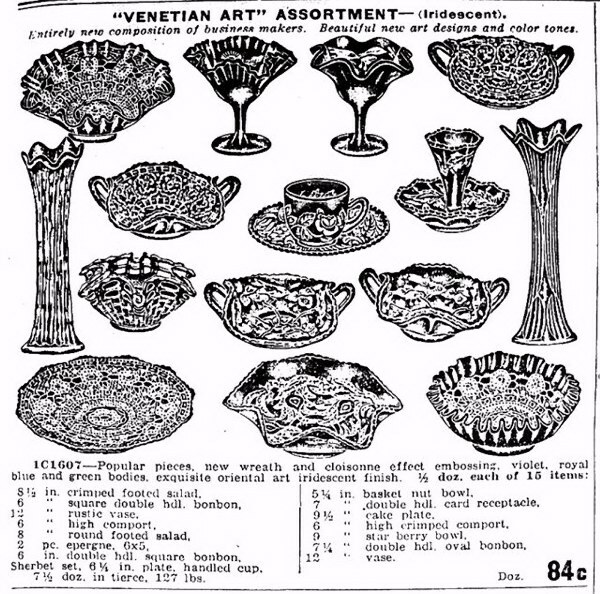 The Seeck Auction ad for the green example shown, stated that a 6” lily had been inserted into the bowl intended for use with the 4 ¾” lily. That particular bowl has only 4 grape clusters. 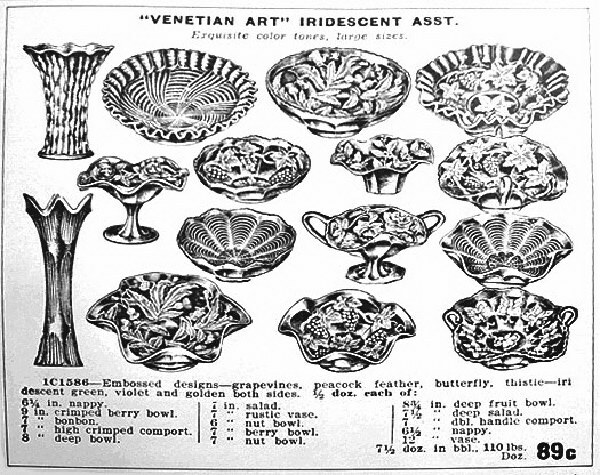 The lily seen in the amethyst epergne is of the smaller height. 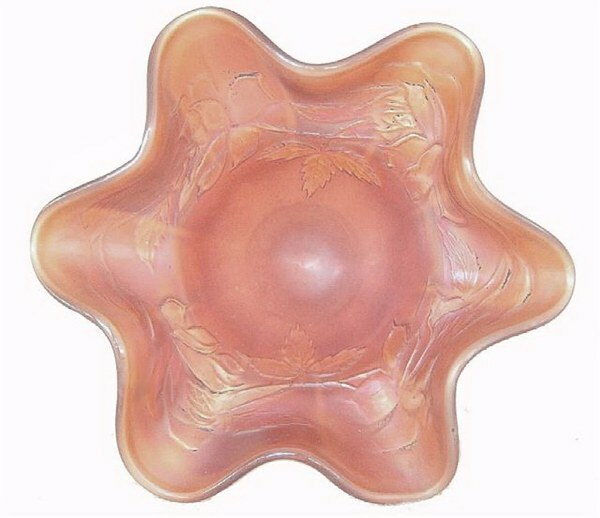 You may view a small size epergne in marigold by clicking into Fenton Glass – Part II. Blue is the only other color found in these epergnes. More of the smaller sizes have emerged over the years since manufacture. against spiritual hosts of wickedness in the heavenly places. And having done all, to stand. with all perseverance and supplication for all the saints.